Atletico Madrid's Antoine Griezmann celebrates his goal against Real Vallecano. The French forward netted the only goal on 74 minutes as Atletico shook off two successive defeats, including last week's 3-1 loss at home to Real Madrid, to reclaim second place in Spain. 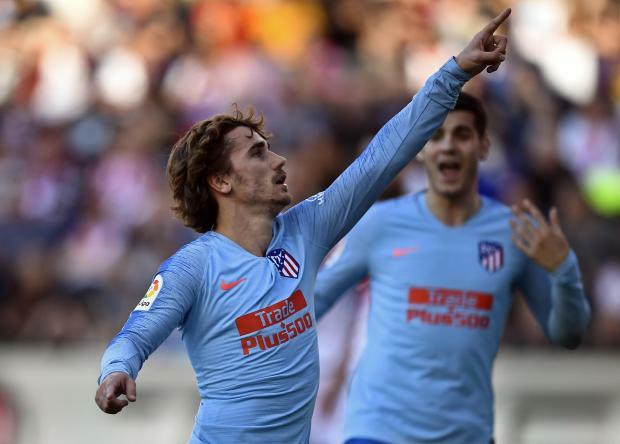 Griezmann struck for the ninth time in his last 11 outings, forcing home from six yards after Alvaro Morata laid off a high, looping ball inside the area. Diego Simeone's side moved to within four points of leaders Barcelona, who host Real Valladolid later, ahead of Wednesday's visit of Italian champions Juventus and Cristiano Ronaldo. Real Madrid, two points behind Atletico in third, could move back into second when they host Girona on Sunday.